college and department. They perform at football, hockey, basketball and other UW sports events. The first Varsity Band Concert was March 21, 1975, in Mills Concert Hall at the Humanities Building. Around 21,000 annually attend the Varsity Band Concert. Mike Leckrone has a secret. Eagle-eyed fans may be wondering why the iconic band conductor has been missing from University of Wisconsin sporting events, especially NCAA basketball tournaments. “I had double-bypass heart surgery,” explains Leckrone, 80. 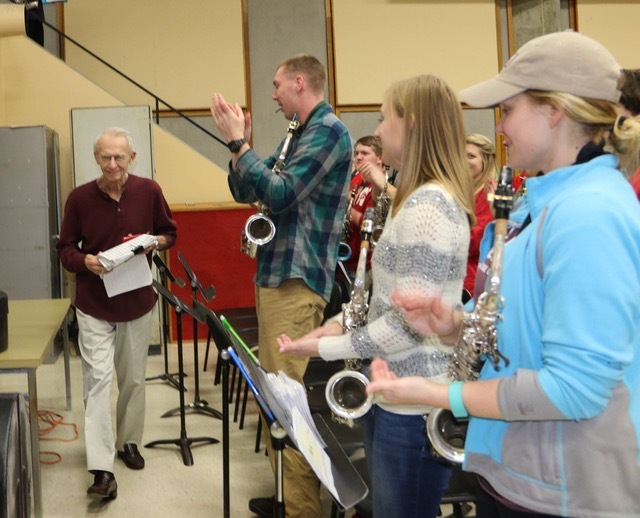 It occurred Jan. 24, and he didn’t return to the Mead Witter School of Music until March 15 to rehearse his 300-member Varsity Band for two hours before Spring Break. There was loud applause and some teary eyes – and a great deal of wariness about returning to work. He received permission from his physician only that morning. In the spring semester the marching band is called Varsity Band. Its biggest event of the year – the three-night Varsity Band Concert at the Kohl Center – is less than a month away (April 20-22). Besides conducting, narrating and performing stand-up, Leckrone annually performs a variety of stunts, such as “flying” mid-air in a harness connected to overhead wires. His somersaults high above the audience are a tradition and also his all-time favorite activity. That’s been firmly ruled out, and Leckrone is looking for other aerial activities. Leckrone has his own ideas about a new theme. “Only half-kidding, I kind of like, ‘Let’s See If He Can Make It Through the Show,” he says, laughing. if the Badgers play next week. Besides audience participation numbers, multimedia displays and pyrotechnics, the 44th annual concert will feature selections from The Beach Boys, “Fiddler on the Roof” and “The Lion King.” Special guests will include trumpeter Grant Manhart, the UW Spirit Squad, Bucky Badger and a few surprises. as Illinois, Iowa, Michigan and Minnesota. The 2017 Varsity Band Concert will be held at 7 p.m. Thursday through Saturday, April 20-22, at the Kohl Center. Tickets are $23. Group and UW student rates are available for the Thursday performance. Children under the age of two do not need a ticket, provided they are accompanied by an adult and do not occupy a seat. Tickets and more information are available here and at badgerband.com, and by calling 1- 800 GO BADGERS. Sponsors of the 2017 UW Varsity Band Concert include: Robert W. Baird & Co., The Wisconsin State Journal, The Badger Herald, WISC-TV3, Mid-West Family Broadcasting, Ward-Brodt, Capitol Centre Market, Channel3000.com, The Concourse Hotel and Governor’s Club, The University Book Store and WSUM-FM.